Lots of greenery on a neutral color palette gives this wedding inspiration shoot at The Garden Villa a chic romantic vibe. Soft white draping with greenery tie backs framed the ceremony space. 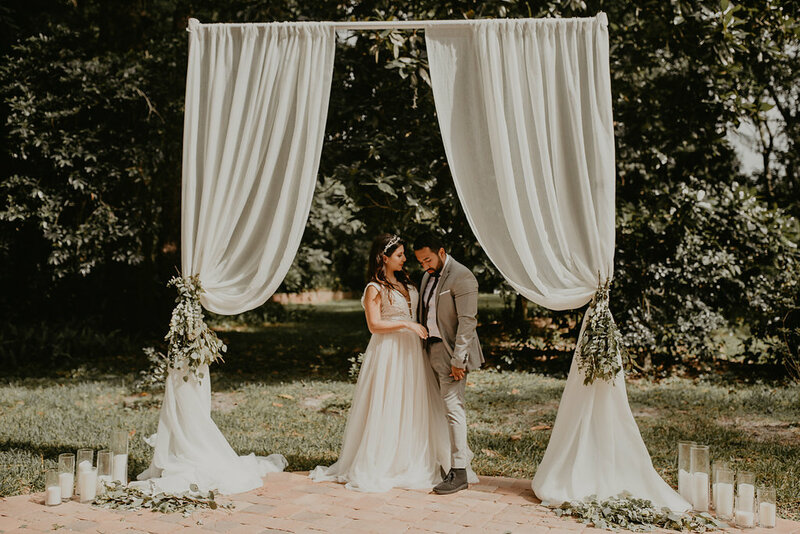 The beautiful flow of the draping matched the bride's flowy gown from Something New Bridal Boutique. Moving to the guest table, a variety of mixed metals popped next to the greenery table runner and white table linen. The team got creative with the bar area. A beverage cart with different libations stood next to a display of copper Moscow mules which hung from what is normally a donut wall. The lounge area had vintage pieces that blended perfectly with the color hues. Making a great spot for the bride and groom cozied up with a delicious mojito!